Add extra comfort to your bedding with our Me Sooo Comfy Bedding Blanket - Ecru. Create a luxuriously soft and comfortable sleep environment with our Coma Inducer Duvet Cover - Me Sooo Comfy - Hint of Mint. 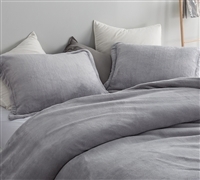 Create a luxuriously soft and comfortable sleep environment with our Coma Inducer Duvet Cover - Me Sooo Comfy - Alloy. Complete your Bedding set with the addictive comfort of the Coma Inducer Sheets. Complete your Bedding set with the addictive comfort of our Me Sooo Comfy® Sheet Set. Complete your Soft Bedding set with the addictive comfort of our Me Sooo Comfy® Sheet Set. Add luxurious, plush comfort to your Bedding with our Coma Inducer Oversized Comforter - Me Sooo Comfy - Alloy. Add luxurious, plush comfort to your Bedding with our Coma Inducer Oversized Comforter - Me Sooo Comfy - Hint of Mint.